Over the past years, many printers shared they were looking into 3D printing. For two reasons: business was rather slow and all reports about 3D printing showed a gigantic new market at their fingertips. But be sure: making that move will not be easy. It is not because it’s called 3D ‘printing’ that’s it’s similar to the ‘printing’ you’re familiar with. And 3D printing (3DP) is even a wrong name: most of ‘additive manufacturing’ (AM) isn’t even related to any printing technology. The benefits of 3DP & AM are very clear: you can do things that were not possible before, both from an economical point of view and from a technical point of view. Really small batches, including a ‘one off’, are now possible. 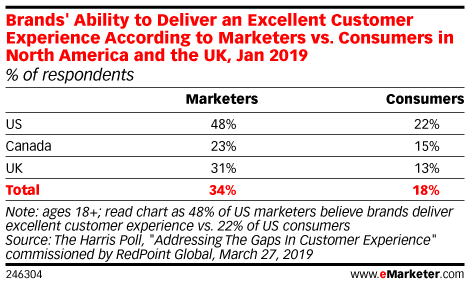 And that does make sense in many market segments: when looking at dental and medical, this will by definition always be a one off. But also in other industries it’s interesting: with a ‘print on demand’ the need for a large stock of replacement parts could be eliminated. From a technical point of view, we can now produce shapes that were previously impossible to create. Especially in the aerospace industry they are looking into these, e.g. for weight reduction and for higher reliability. But the world of 3DP & AM is complex, it is very complex… Just look at the most used technologies at this moment. Some are related, others are very different. The most comprehensive overview I found, was at 3dhubs.com. They also have a big infographic on this topic, which I used in the top picture. CDLP: continuous direct light processing (sometimes also called continuous liquid interface production, CLIP). Materials used: standard, tough, flexible, transparent, & castable resins. Powder bed fusion: powder particles will be fused together by a thermal source. The type of thermal sources depends on the type of powders that need to be fused. SLS: selective laser sintering. Materials used: nylon, alumide, carbon fibre-filled nylon, PEEK, PrimePart (flexible) nylon. SLM, DMLS: selective laser melting, direct metal laser sintering. Materials used: aluminium, titanium, stainless steel, nickel alloys, cobalt-chrome. EBM: electron beam melting. Materials used: titanium, cobalt-chrome. MJF: multi jet fusion. Materials used: nylon. Material extrusion: material is extruded through a nozzle, onto a build plate. FDM: fused deposition modelling (sometimes also called: fused filament fabrication, FFF). Materials used: ABS, PLA, nylon, PC, fire-reinforced nylon, Onyx, exotic filament (bamboo-filled, wood-filled, copper-filled etc.). Material jetting: materials are printed one layer at the time. Material jetting (photopolymer). Materials used: rigid, transparent, multi-color, rubber-like, ABS-like & heat resistant resins. Nano particle jetting (liquid containing nanoparticles). Materials used: stainless steel, ceramics. DOD: drop on demand. Typical is that 2 types of material are jetting: one with the build materials, the other with dissolvable support material. Materials used: wax. Binder jetting: a binding agent is jetted onto a powder bed. Materials used: silica sand, PMMA particle material, gypsum, stainless steel, ceramics, cobalt-chrome, tungsten-carbide. Direct energy deposition (DED): material is melted as it is deposited. LENS: laser engineered net shape. Materials used: titanium, stainless steel, aluminium, copper, tool steel. EBAM: electron beam additive manufacture. Materials used: titanium, stainless steel, aluminium, copper nickel, 4340 steel. Although this overview seems already quite impressive, it’s certainly not complete. When looking at materials used, it lacks e.g. human tissue, cellulose and food stuff like pasta and chocolate. And we might see new technologies in the future, either completely new or variations of the above. 3DP & AM is a market that is still evolving rapidly. 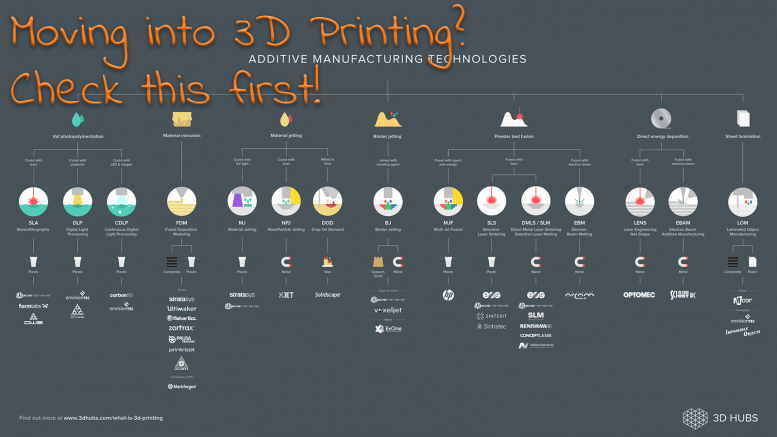 When moving into 3DP & AM you should stay on top these evolutions! New developments might make your offering expensive, or even irrelevant. This one is probably similar to ordinary printing: also in 3DP & AM, design and finishing are important. E.g. while designing a ‘shape’ that will be printed, you need to take into account certain facts and necessities. In many cases it will be necessary to print a ‘support’, which will support the material during the manufacturing process. When the complete shape is printed, that support material needs to be removed. Another important design aspect is ‘wall thickness’. There is an absolute minimum thickness, for every technique, for every material. If you go below that minimal wall thickness, the shape will break. As already mentioned, one of the finishing options will be the removal of the support material. And that might include using a piece of sandpaper… Some other types of finishing: painting, varnishing, drilling, machining, grinding, milling and heat treatments. Now that we’ve covered the technical (and maybe a bit boring) stuff, let’s take a look at the potential markets. And this is extremely diverse… This can be from very small (carbon nanotubes), to very big (houses and bridges). From an industry perspective, the main industries where we see 3DP & AM at this moment are: aerospace, architecture, art, automotive, consumer goods and electronics, defense, dental, education, jewelry and fashion, medical, molding, optics, industrial goods. And of course: product design and prototyping. That has been a big market for 3DP & AM since a few decades, when it was called ‘rapid prototyping’ instead of 3DP & AM. If you want to see those industry uses in more detail, I can recommend you following overviews by: Javelin Tech, Sculpteo and Ultimaker. 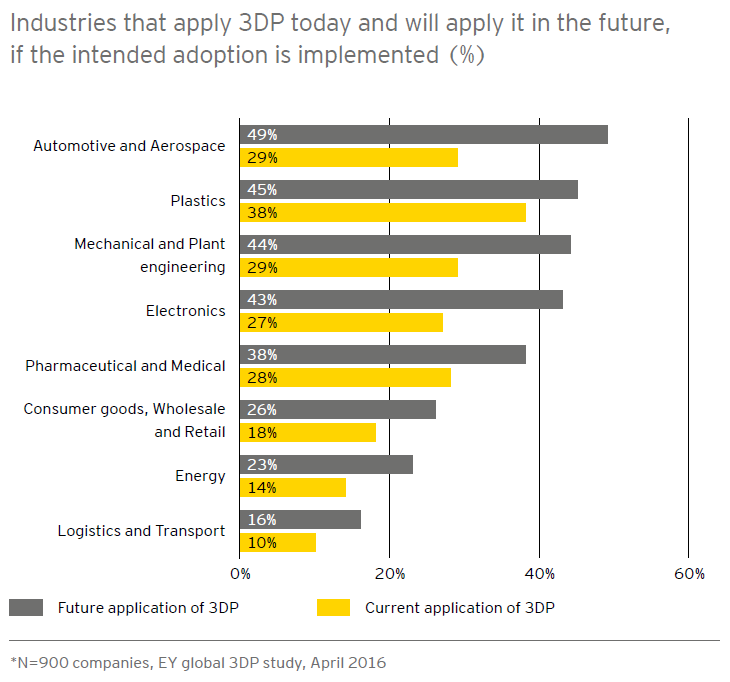 According to a study by EY, these industry segments are interested in 3DP & AM. But there is also another part of the ‘where’ question: in what kind of companies will we see 3DP & AM? And that’s a really important one if you want to start a business doing 3DP & AM. In many cases, manufacturing companies will have their own 3DP & AM department. Siemens e.g. is working on this. But others like to work with specialized partners, e.g. Airbus has done so for some time. And there are also companies that provide 3DP & AM as a service: 3DPaaS if you like. E.g. in Dubai there recently opened a dedicated 3DP & AM factory. So it seems to depend. And this is something you should investigate before entering the 3DP & AM market! 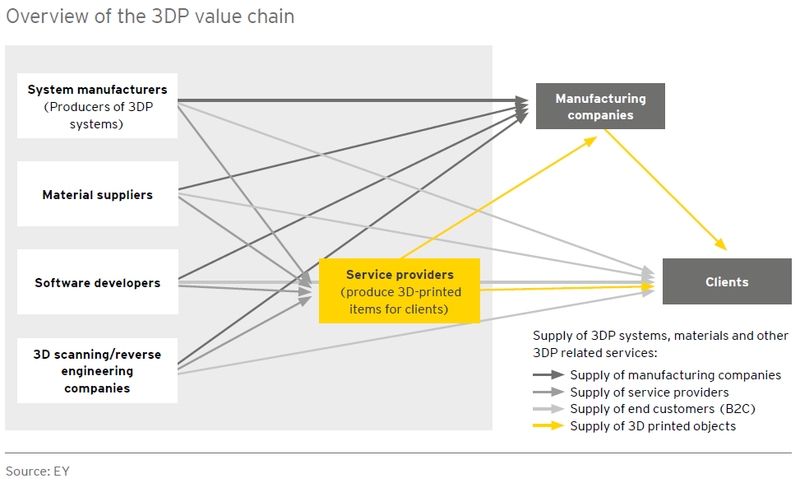 The 3DP & AM Value Chain, according to EY. With the information I provided above, I think you clearly see that 3DP & AM is a very diverse market. So if you want to move into 3DP & AM, the next question will be: what do you want to do with it? And for which customers? What will you offer them? Which kind(s) of technology do you need to fulfill their wishes? What kind of knowledge do you need to fulfill their wishes? And what will be your business model? Because that’s where it will all come down to: how are you going to make money with it? And that’s no different from your current situation… So it will come down to having a strategy and providing everything that is needed to execute it flawless. 3D Printing and Additive Manufacturing have been hyped already for some time. And 3DP & AM is much more than just a hype: it will transform most, or even all, industries and society, eventually. But it is not an easy market. Due to the very different nature of different submarkets. Due to the already existing providers of 3DP & AM (don’t assume you are the only one!). So as with every other business it comes down to business as usual… having a strategy, finding customers, providing them with the best offer. PS: if I didn’t scare you and you do want to move on, here are a few excellent resources: 3D Hubs, 3D Print, 3Ders, the EY Global 3D Printing report. Wohlers Associates publishes an annual ‘progress report’. This is not free, but it’s not that expensive either. UPDATE 21/06/2017: I forgot to mention one aspect in the article above: mandatory certifications and other legal issues… After my original article was published, 3ders.org published a comprehensive article on aerospace and the need for FAA certification. In other industry segments there might be similar certifications. If you want to target a specific market, you need to check this upfront! And a similar issue could be copyright and intellectual property… This aspect has e.g. been covered by ZDNet. The World Intellectual Property Organisation (WIPO) published a 28 pages ‘working paper‘ in 2015 and earlier this year they covered important topics in a shorter article. And this is an assessment made for the European Commision. UPDATE 04/08/2017: Gartner’s 2017 3D Printing Hype Cycle is out. 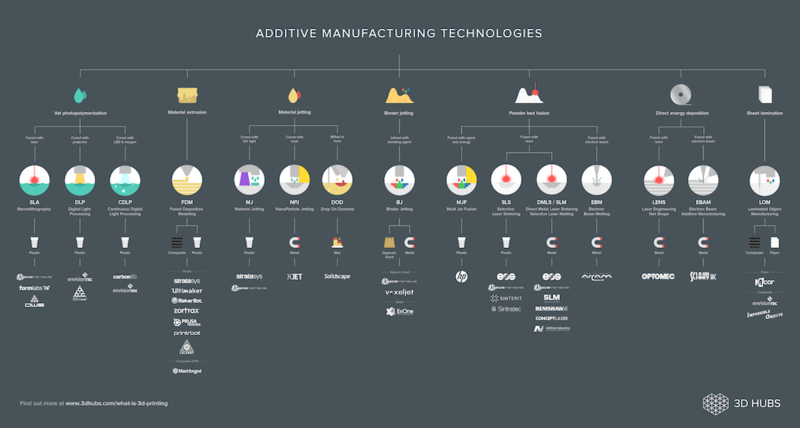 It looks at the different subsegments of 3D printing & additive manufacturing and places the technologies on their hype curve. In case you are not familiar with the Gartner Hype Cycle, you can learn about it here. 2 Comments on "Printing companies looking into 3D printing: check this first!" Flyeralarm in Germany started 3D-printing in Germany and produced and sold them via their web portal. After several tests and a broad experience they decided to discontinue this type of service. If a power house such as Flyeralarm (several offices in major cities in Germany, a huge IT-staff and several marketing experts) is not able to create a profitable business, who else can do it? 3DP & AM is such a broad field. It’s like the transportation industry, which ranges from a cargo bike, over trucks and trains, to airplanes and cargo ships. And in every way a cargo bike is very different from a cargo ship, except that it’s ‘transportation’. The one type of 3DP & AM is very different from the other.